Eaton is hitting on all cylinders today, but it still looks like a reasonably priced high-yield stock with plenty of room to grow. Diversified power management company Eaton Corporation plc (NYSE:ETN) isn't exactly a household name, but that makes sense since the industrial giant sells primarily to other businesses. With a 3.2% yield, however, dividend investors looking for a reliable and growing stream of income should get to know this company. Here are three reasons you'll want to consider buying Eaton Corporation today. Eaton's 3.2% yield is more than 50% above the yield you would get from buying an S&P 500 Index fund. It has increased its dividend annually for nine years, which is nice but not exactly impressive considering the list of companies that have dividend streaks of 10 years or more. That said, the dividend was held steady, not cut, around a decade ago. And the long-term trend has been for generally higher dividends over the last couple of decades. Eaton's price-to-earnings ratio of around 11.8, meanwhile, is below its five-year average of 16.4. The P/E is also lower than the average for the industrials group of 17.8, using Vanguard Industrial Index Fund ETF as a proxy. 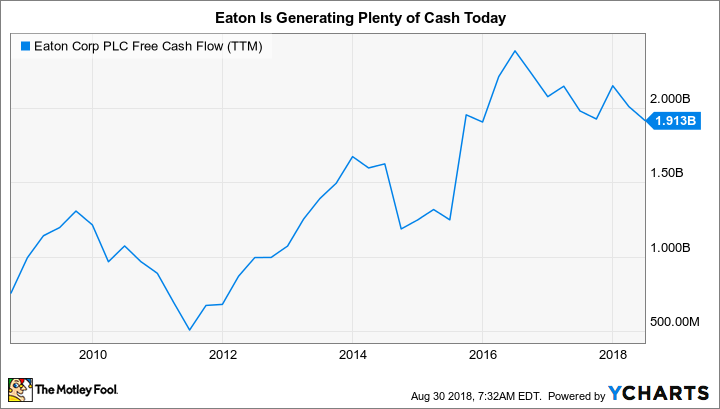 To be fair, Eaton's price-to-sales, price-to-book value, and price-to-cash flow ratios are suggesting that it is, at best, fairly priced relative to its own history. But even there, two of these three metrics are lower than the index's numbers. While Eaton may not be a screaming buy, it looks like it is trading at a fair to decent price. All in all, in today's expensive market, Eaton looks like a solid option for income-focused investors. One of the most compelling things about Eaton today, however, is that management believes it has several years of solid market growth ahead of it. Of the 16 largest end markets that Eaton serves, only three appear to be in the late stage of their typical cycles. Six, including key construction markets, commercial aerospace, and U.S. utilities, are in the mid stage. The rest are in an early stage of their cycles, including mining equipment, data centers, defense aerospace, and agricultural equipment. Data source: Eaton Corporation plc. That suggests that the company's robust growth over the past year or so has room to keep going. Helping that along should be a new division created this year, eMobility. It's tiny right now, at a run rate of less than $400 million in revenue annually. But it is already winning contracts, and Eaton thinks it could be a $4 billion-revenue business by 2030. This division, as its name implies, is intended to serve the electric vehicle market, which is quickly growing in importance. The third reason Eaton should be of interest is that it has finally worked through the Cooper Industries acquisition, the largest deal in its history. Management had been reluctant to make any big portfolio changes, notably sizable acquisitions and dispositions, while it was methodically focused on integration. Now, however, it is generating lots of free cash and is more willing to tinker with its business. And that could give management another lever to drive long-term growth. One clear sign of this shift was the 50/50 joint venture it entered into with Cummins Inc. in mid-2017. The new company, controlled by Cummins, serves the mid- and heavy-duty truck market with high-tech transmission products. It's still early days for the partnership, but this move by Eaton is noteworthy in that it signals management's willingness to adjust its portfolio in a meaningful way. The new eMobility division is another positive sign here. That said, acquisitions are back on the table, with CEO Craig Arnold explaining during the second-quarter conference call that "the company is certainly in a position today both from an organizational capacity standpoint and from a cash standpoint that we have the ability today to reenter the M&A market." He added that the company is actively looking at opportunities but that it will be disciplined in its investments. ETN Free Cash Flow (TTM) data by YCharts. The company estimates its cost of capital to be between 8% and 9%. Management is looking for returns of at least 300 basis points above that level after the new asset has been fully integrated. Arnold says those numbers must be met or it will take a pass, so don't expect a lot of deal activity. That said, prudent acquisitions are better for investors than deals made at any price just to push the top line higher. And when a deal does get inked, you can be confident that management thinks it will add long-term value for shareholders. When you step back from industrial giant Eaton Corporation plc, you might be tempted to yawn even though recent results have been pretty strong. That's understandable, since this more-than-100-year-old company is largely outside of the public spotlight and rarely takes big risks. However, with a high yield and decent valuation, strong recent growth and solid prospects for continued growth, and the shift back toward portfolio management (notably that the leadership team is again open to acquisitions), Eaton looks like a good stock for income investors to put on their buy lists today.